THE computer has become indispensable in finance, industry, and government. Because it can follow instructions exactly, remember everything, and calculate to the thousandth of a second, it can quickly and precisely analyze problems that would ordinarily require enormous amounts of,time and energy to solve. Our sport scientists know a good thing when they see it, and it didn't take them long to "discover" the electronic wizard. In competitive athletics, everyone is always looking for perfection-or at least an edge and the computer lends itself perfectly to the analysis of technique. It is the one device that surpasses the limits of what the human eye can see and the intuition deduce. Human judgment is still critically important, however. As in the world of commerce, where decisions are based upon an executive's experience and interpretive ability, the coach must be the ultimate decision-maker in training. The computer must be regarded as a tool in the achievement of the desired end. The success of East Germany in international competition can be considered a triumph for national organization-for what can be accomplished by the pooling of national resources. international competition a top priority. They sought out their best young talent for intensive training in the finest of facilities, and recruited science in the development of national training institutes. The United States has learned something from East Germany. The new U.S. Olympic Training Centers attest to the principle that winning requires more than the dedication of individual athletes, that it also requires a national effort. The United States has always had the resources in its talented young athletes, dedicated coaches, brainpower, and wealth. All that it needed was to blend them. In the past, athletic achievement depended mainly upon individual talent. Genetically superior athletes who successfully interacted with the available facilities, equipment, and personnel dominated the list of worldrecord holders. learn to use such technology in optimizing the function of the body in each event. Since the body abides by the same physical laws as all other earthly objects, its performance must be governed by the laws of motion. Take throwing, running, and jumping. It's impossible to throw the shot 20 meters without attaining specific values in shot velocity and angle of release. These values cannot be altered for different athletes. Each particular shot velocity has just one optimal angle. For a long jumper to leap 8 meters, he must produce certain forces on the ground to propel his body with a specific reaction force at a particular angle. This force is unique; it is impossible to cover the same distance with only a fraction of this force, as gravitational pull acts uniformly, regardless of the jumper. The concept emphasized here is that all bodies, athletes, implements, or machines, are affected by and must adhere to the laws of motion. A number of scientists have long recognized these facts of force and motion and their relationship to humans. But they lacked the kind of equipment that could measure and analyze the motions and forces involved, the kinetics, and this impeded further research. The computer provided the initial resource. Another important contributor was the National Aeronautical and Space Agency, which made detailed measurements of the human body. These measurements included the relative mass for body segments such as arms, legs, or hands when given the overall height and weight of the individual. Another critical element was the high-speed movie camera that provided sequences of the body in real time motion. 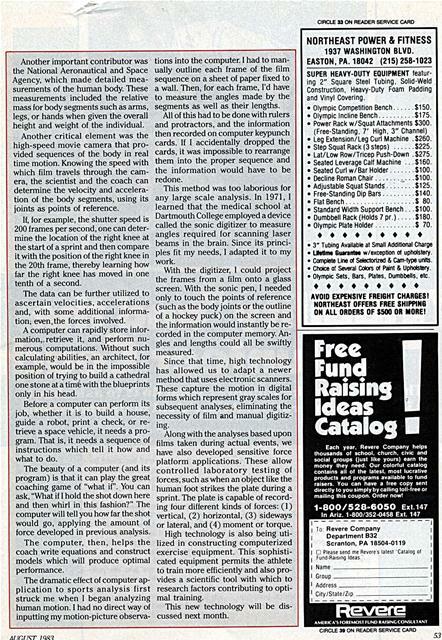 Knowing the speed with which film travels through the camera, the scientist and the coach can determine the velocity and acceleration of the body segments, using its joints as points of reference. If, for example, the shutter speed is 200 frames per second, one can determine the location of the right knee at the start of a sprint and then compare it with the position of the right knee in the 20th frame, thereby learning how far the right knee has moved in one tenth of a second. The data can be further utilized to ascertain velocities, accelerations and, with some additional information, even,the forces involved. A computer can rapidly store information, retrieve it, and perform numerous computations. Without such calculating abilities, an architect, for example, would be in the impossible position of trying to build a cathedral one stone at a time with the blueprints only in his head. Before a computer can perform its job, whether it is to build a house, guide a robot, print a check, or retrieve a space vehicle, it needs a program. That is, it needs a sequence of instructions which tell it how and what to do. 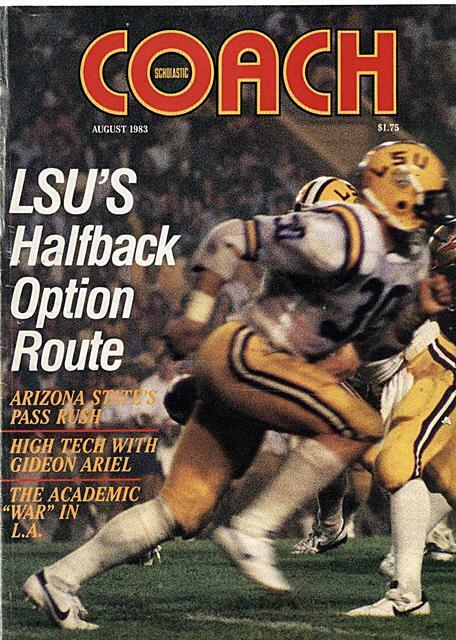 The beauty of a computer (and its program) is that it can play the great coaching game of "what if". You can ask, "What if I hold the shot down here and then whirl in this fashion?" The computer will tell you how far the shot would go, applying the amount of force developed in previous analysis. 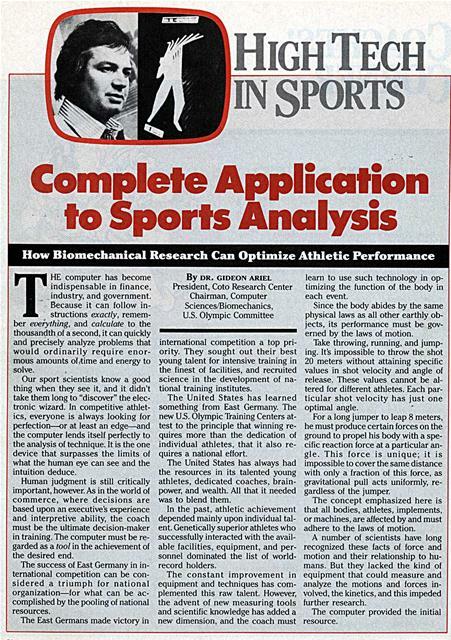 The computer, then, helps the coach write equations and construct models which will produce optimal performance. tions into the computer. I had to manually outline each frame of the film sequence on a sheet of paper fixed to a wall. Then, for each frame, I'd have to measure the angles made by the segments as well as their lengths. All of this had to be done with rulers and protractors, and the information then recorded on computer keypunch cards. If I accidentally dropped the cards, it was impossible to rearrange them into the proper sequence and the information would have to be redone. This method was too laborious for any large scale analysis. In 1971, I learned that the medical school at Dartmouth College employed a device called the sonic digitizer to measure angles required for scanning laser beams in the brain. Since its principles fit my needs, I adapted it to my work. With the digitizer, I could project the frames from a film onto a glass screen. With the sonic pen, I needed only to touch the points of reference (such as the body joints or the outline of a hockey puck) on the screen and the information would instantly be recorded in the computer memory. Angles and lengths could all be swiftly measured. Since that time, high technology has allowed us to adapt a newer method that uses electronic scanners. These capture the motion in digital forms which represent gray scales for subsequent analyses, eliminating the necessity of film and manual digitizing. Along with the analyses based upon films taken during actual events, we have also developed sensitive force platform applications. These allow controlled laboratory testing of forces, such as when an object like the human foot strikes the plate during a sprint. The plate is capable of recording four different kinds of forces: (1) vertical, (2) horizontal, (3) sideways or lateral, and (4) moment or torque. High technology is also being utilized in constructing computerized exercise equipment. This sophisticated equipment permits the athlete to train more efficiently and also provides a scientific tool with which to research factors contributing to optimal training. This new technology will be discussed next month. SUPER HEAVY-DUTY EQUIPMENT featuring 2" Square Steel Tubing, Solid-Weld Construction, Heavy-Duty Foam Padding and Vinyl Covering. ï¿½	Olympic Incline Bench $175. ï¿½ Power Rack w/Squat Attachments $300. ï¿½ Leg Extension/Leg Curl Machine .$260. ï¿½	Step Squat Rack (3 steps) $225. ï¿½ Lat/Low Row/Tricep Push-Down .$275. ï¿½ Seated Leverage Calf Machine ... $160. ï¿½	Seated Curl w/Bar Holder $100. ï¿½	Decline Roman Chair $100. ï¿½	Adjustable Squat Stands $125. ï¿½	Free-Standing Dip Bars $140. ï¿½	Flat Bench $ 80.
ï¿½ Standard Width Support Bench ... $100. ï¿½	Dumbbell Rack (Holds 7 pr.) $180. ï¿½	Olympic Plate Holder $ 70.
ï¿½ UMlms Guarantee w/exception of upholstery. ï¿½ Complete Line of Selectorized & Cam-type units. ï¿½ Choice of Several Colors of Paint & Upholstery. ï¿½	Olympic Sets. Bars, Plates, Dumbbells, etc. Generated on 4/20/2019 12:03:15 PM (PST) ADI/HQ/GBA/2019/ARIELCLOUD/v3.0.2018.0126.